Americans overwhelmingly see drug addiction as a problem in their local community, regardless of whether they live in an urban, suburban or rural area, according to a new Pew Research Center survey. The public’s concerns come amid steep increases in the number and rate of fatal drug overdoses across all three community types in recent years. Nine-in-ten Americans who live in a rural area say drug addiction is either a major or minor problem in their community, as do 87% in urban and 86% in suburban areas, according to the survey of 6,251 adults, conducted Feb. 26-March 11. 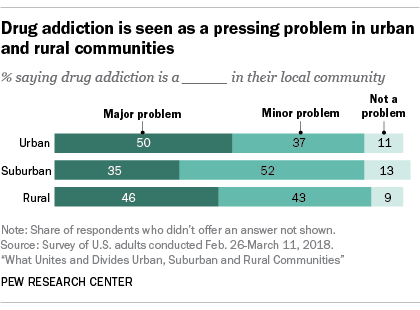 Substantial shares in each community type say addiction is a major problem, though people in urban and rural areas are more likely to say this than those in a suburban setting (50% and 46%, respectively, compared with 35%). The problem of drug addiction has drawn widespread attention as the United States confronts an opioid epidemic. President Donald Trump last year declared the epidemic a national public health emergency, and statistics from the Centers for Disease Control and Prevention underscore the deadly toll that opioids and other drugs have taken. Nationally, more than 63,600 people died of a drug overdose in 2016, the most recent year for which full data are available. (Preliminary data suggest the 2017 number will be even higher.) That’s an increase of 21% from the prior year and nearly double the 34,425 drug overdose deaths that occurred a decade earlier. Opioids – ranging from illegal street drugs like heroin to prescription painkillers – have played an especially lethal role: About two-thirds (66%) of the fatal overdoses in 2016 involved an opioid. Suburban counties not only had the most overall drug overdose deaths in 2016, they also had the highest age-adjusted rate of deadly overdoses – a metric that controls for differences in population size and average age across the three community types. The age-adjusted rate of drug overdose deaths in suburban counties was 21.1 per 100,000 people in 2016, compared with 18.7 per 100,000 in rural counties and 18.5 per 100,000 in urban counties. 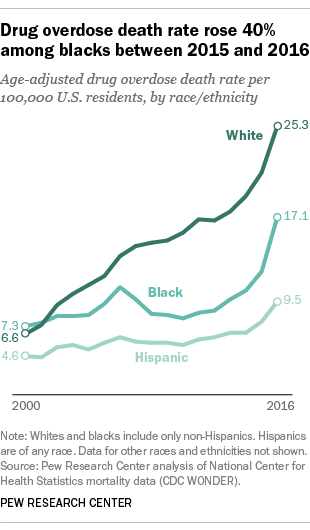 Whites, blacks and Hispanics all have experienced substantial increases in fatal drug overdose deaths in recent years, but there has been an especially large rise among blacks. The overdose death rate for black Americans rose 40% between 2015 and 2016, from 12.2 deaths per 100,000 people to 17.1 per 100,000. Among black men in urban counties, specifically, the fatality rate rose 50% – from 22.6 deaths per 100,000 people in 2015 to 34.0 per 100,000 a year later. Despite the sharp year-over-year increase among blacks, whites continue to have a substantially higher overall drug overdose death rate (25.3 per 100,000) than both blacks (17.1 per 100,000) and Hispanics (9.5 per 100,000). In the Center’s new survey, about half of blacks (49%) say drug addiction is a major problem where they live, as do 45% of Hispanics and 40% of whites. Majorities of eight-in-ten or more across the three groups say this is at least a minor problem in their community.